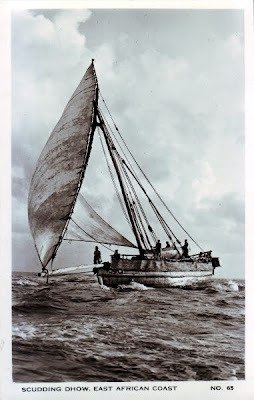 This real photo postcard of a traditional Arab sailing vessel - a dhow - used to this day along the coasts of East Africa, is in almost mint, uncirculated condition and was issued by the studio A.H. Firmin, A.I.B.P., A.R.P.S. The location is somewhere in the Lamu Archipelago in Kenya. As is often the case when I start looking into the history behind a postcard on this blog, an hour or so on Google will throw up some amazing stories! On this particular occasion it emerges that the rather formal photographer's credit A.H.Firmin refers to the well known Nairobi photographer and passionate mountaineer Arthur Firmin who took numerous photographs of Mount Kenya. Born in Kenya in 1912, he returned to his birthplace in 1937 after having been educated in England, joining the Kenya Police Force, in which he served throughout the war in the role of official photographer. He eventually left and set up his own business in 1946. Tragically Arthur Firmin died of pneumonia in 1957 after a fall in which he broke his leg during the Mountain Club of Kenya's failed attempt to climb Himal Chuli in the Himalayas. He is remembered today on Mount Kenya by Firmin's Tower, a pillar of rock on the north face of Batian, one of the mountain's twin peaks, which he scaled in 1944. Read more about Arthur Firmin here. You have some great postcards and very interesting descriptions! Happy PFF. The historical information about the photographer really adds to the postcard's interest. Thanks for sharing. It's wonderful, isn't it, how much you can learn from a single postcard. The card is lovely in itself, but the information behind it brings it to life. At first I thought the photo wasn't really a photo. The sky looks like a cool gray, and the boat and sea look like warm gray--at least on my monitor. Happy PFF! What a treat to read your blog. What did we every do before Google? What a powerful image! Seeing a billowed sail and choppy sea waves make me long to smell an ocean breeze again!